Tennessee Williams’s dramatic opus as well as his abundant correspondence have been minutely and well systematized, interpreted, and to a large extent published, during the decades before and after his death. A large contribution to this process was made by the Harry Ransom Center’s archive. The lesser known part of the Williams opus which deals with his painterly creation is also housed at the Center. 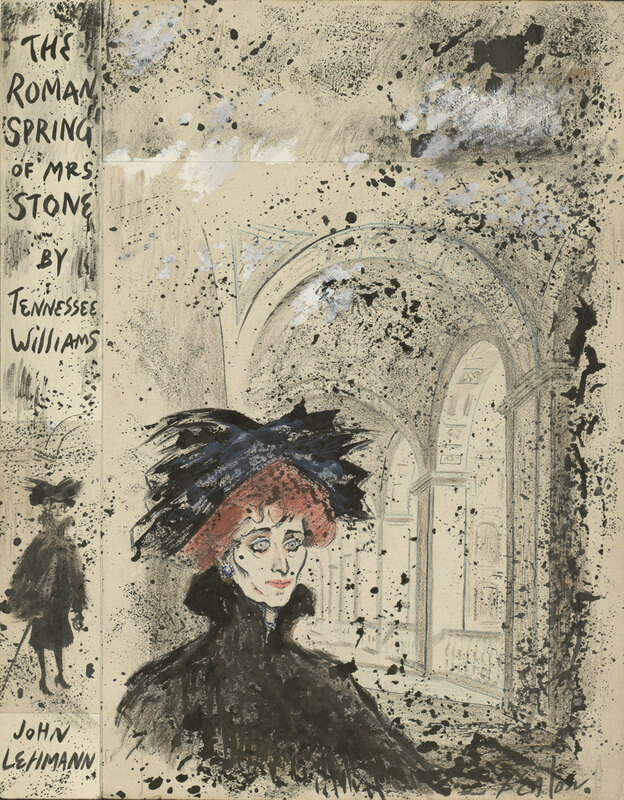 The Tennessee Williams art collection consists of paintings, drawings, and prints that are either portraits of Williams by other artists, related to Williams, or created by Williams himself. Tennesse Williams (American, 1911-1983). Untitled [portrait of Frank Merlo], not dated. Oil on paper board. 11 15/16 x 8 1/4 inches. Signed T.W. Reprinted by permission of Georges Borchardt, Inc., for the Estate of Tennessee Williams. Among Williams’s own paintings in the Ransom Center’s Art Collection, it is worth emphasizing the several portraits of his longtime romantic partners Frank Merlo and Pancho Rodriguez. 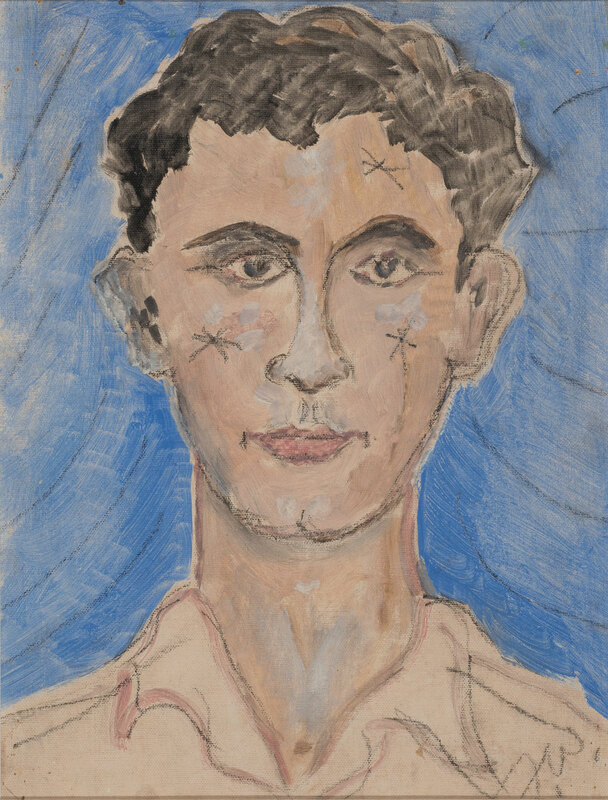 Outside the purely formal quality of his artistic effort, what these portraits offer is an extended, subtle story of relationships which have to a large extent determined Williams’s life and work. Each of the portraits, and especially their detail, color schemes, and atmosphere, represent a precious map for summing up impressions on the delicate relations that function as reference symbols of a life and of that life’s work. 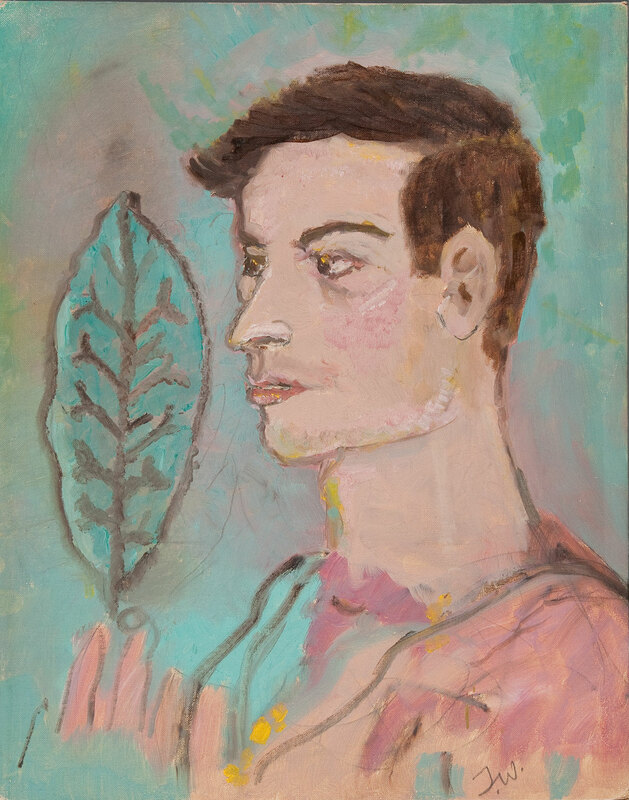 Tennesse Williams (American, 1911-1983). Untitled [portrait of Pancho Rodriguez], not dated. Oil and charcoal on canvas board. 23 x 19 3/4 inches. Signed T.W. Reprinted by permission of Georges Borchardt, Inc., for the Estate of Tennessee Williams. Among the works by other authors in the Art Collection which refer to Williams’s dramatic oeuvre are the Cecil Beaton drawing made for the cover of The Roman Spring of Mrs. Stone as well as the sketch drawing by artist Thomas Hart Benton entitled Poker Night (1948). Beaton’s work belongs to a series of 11 book cover illustrations. 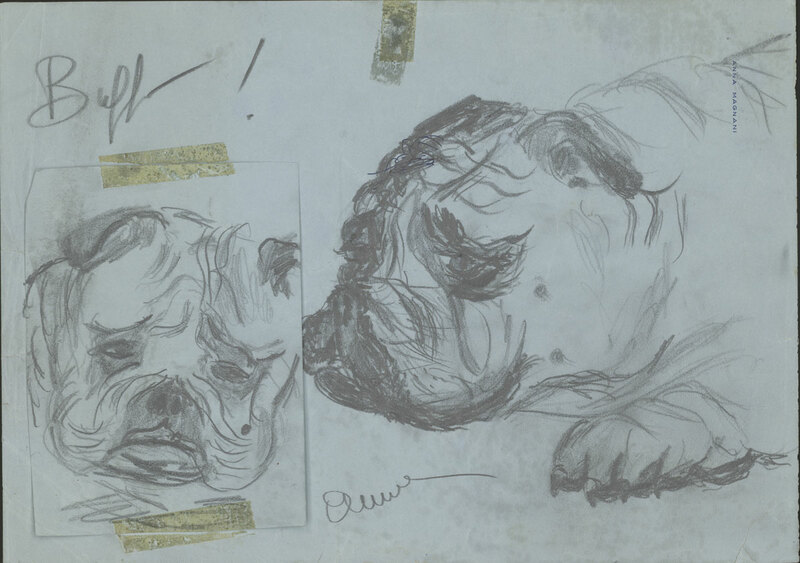 These works, and actress Anna Magnani’s drawing of Williams’s dog Buffo, not only address their primary theme, but also speak to the people with whom Williams socialized and represent a discrete chronicle of an era and the people who helped shape it. Ana Magnani (Italian, 1908-1973). Buffo!, ca. 1950s. Pencil on paper. 8 1/4 x 11 1/2 inches; 5 5/16 x 4 inches. Williams’s plays also inspired other artists. In 1947, film producer David O. Selznick commissioned a painting by Benton entitled The Poker Night, held by the Whitney Museum of American Art, as a gift to his wife Irene Mayer Selznick, who was producing her first Broadway play: A Streetcar Named Desire. The painting depicts one of the key scenes from Williams’s play. Tennessee Williams himself was indirectly engaged in the creation of Benton’s painting (through offering advice, choosing the scene, and commenting on modes of representation). During the following years this painting would accompany the production to various venues across the U.S. in the form of a unique poster. The fact that the painting was done by an established artist influenced the perception of theater‐goers—instead of serving as an informative or attractive promotion, the painting functioned as a separate, autonomous work of art, attracting viewers regardless of the show it accompanied. This is especially pertinent because during the 1940s connections between high art and popular culture were still rare. The process of appropriating the popular and fictional into works of high art was still not frequently performed. The Poker Night, however, was not Benton’s first visual interpretation of a dramatic work. In 1940 Benton was, together with eight other artists, commissioned to paint scenes of his own choice during the filming of John Ford’s The Long Voyage Home, an adaptation of the classic play by Eugene O’Neill. Dr. Simona Cupic is a professor of art history at the University of Belgrade, Serbia. She is the author of four books: Themes and Ideas of Modernity: Serbian Painting 1900–1941; Bourgeois Modernism and Popular Culture: Episodes of the Fashionable, Faddish, and Modern 1918–1941; The JFK Culture: Art, Film, Literature, and Media; and Petar Dobrovic (1890–1942). Cupic accessed the Tennessee Williams Art Collection to study the playwright’s significant interest in and relationship with painting. Cupic’s research as fellow was supported by the Fleur Cowles Endowment Fund. Her forthcoming book is tentatively titled “Tennessee Williams and Visual Culture,” and features essays by art historians, literary critics, historians, and film scholars.